Wheeling Superheroes Recipient: Malu, 11 year old Boxer mix from Sunrise, Florida. Working her wheelchair skills with the help of her favorite treat--papayas! Wheeling Superheroes Wheelchair Recipient: Max 9 year old boxer from Centerton Arkansas. “Max is a 9 year old Boxer with Degenerative Myelopathy. He is struggling to walk and requires assistance with daily tasks. Max still has a lot of life to live and a family that loves him so much and wants him to enjoy his remaining years. A wheelchair would allow him to run, play and enjoy quality time with us and our rescue dog Coco. “—Shawna, Max’s Mom. Wheeling Superheroes Wheelchair Recipient: Axel 8 year old lab mix from Clark’s Point, Canda. "Thank you so much for giving us moments like this! ...at least he can have some joy playing with his training fun and get some exercise! Thank you! "—Tiffany, Axel's mom. Lola started slowly loosing the use of her rear legs about 5 years ago due to a degenerative disc disease. She is now paralyzed in her rear legs and has not been able to go on her walks with with her puggle brother Otis and pug sister Lily for the past two years. Look at Boy Blue - our amazingly handsome, wonderful, and now mobile with new wheels from Eddie's Wheels for Pets. We want to thank Wheeling Superheroes (especially Christina and Ozge) who reached out and have picked up 100% of the cost for Blue's new wheels. What a wonderful organization - check them out - https://www.wheelingsuperheroes.org. Blue just got his chair today so is still getting used to its - his foster mom said he's such a good boy - and as you can see he has his foster human siblings are helping him. THANK YOU SO SO MUCH to everyone involved in helping this special blue boy along! Wheeling Superheroes Wheelchair Recipient: Cora Rose! 2/15/2018 Cora's now a double amputee. Had to take drastic measures to save her life. She is out of surgery and recovering. She has a lengthy road ahead of her because her pelvis is still healing from break. 4/22/2018 CORA GETS HER LEGS!!! Patsy (Heidi's mom) will be turning 82 years old in July, and her little miniature Poodle, Heidi, is 14 years old. Heidi had gotten some kind of back injury & had been like dragging herself for about a year. Wheeling Superheroes Wheelchair Recipient: Lola! Collierville, TN "Lola is a 12.5 yr old Pug who has been having problems getting around in her rear legs. She suffers from significant arthritis in her hips and knees. She currently takes Galliprant, an NSAID, which helps, but I think she could also benefit from you doggy wheels that you sell. Wheeling Superheroes Wheelchair Recipient: Sadie is a 10 year old pug from Burley, ID who has mobility issues from a previous back injury. Her back legs won't hold her up when she tries to walk. Now, with the help of a wheelchair, she's starting to be mobile again. Wheeling Superheroes Wheelchair Recipient: Lola Mae 💓 13 Year Old Pug from Nevada City, CA * Thank you to all who made this happen! Thank you to Ben P. & Kaitlon G. (@kaitlongentry) for sponsoring Lola Mae's @walkinpets wheelchair! Thank you to Anna Marie S. and Richard T.
Wheeling Superheroes Wheelchair Recipient: Harry, 10-ish Dalmatian/Chocolate Lab Mix "Harry is a foster dog that I have through Dalmatian Resvue of Southern California. He was dumped on a freeway in Southern California and rescued from the county shelter by Dalmatian Rescue. He has Hip Displasia and significant arthritis in his hips and lower back. Wheeling Superheroes Wheelchair Recipient: Misha 12 Year Old Pug | Ardmore, PA Misha is a fawn pug adopted from the Delaware Valley Pug Rescue back in Jan of 2013, when she was almost 7 years old. Wheeling Superheroes Wheelchair Recipient: Mabel 4 Year Old Frenchie Small Wheelchair Oak Grove, OR Mabel is 6 weeks post surgery for Intervertebral Disc Disease (IVDD) without seeing any progress. She is still unable to feel or move her hind legs. Even without the use of her hind legs, she's still a goofy and spunky girl! Wheeling Superheroes Wheelchair Recipient: Betsy Bumbles! 💓 Betsy Bumbles is a 12 year old pug who received her Walkin' Pets by HandicappedPets.com wheelchair from us today! Betsy's mom Denise, noticed about two years ago that her tail was hanging lower when before it was so tight in a curl. Wheeling Superheroes Wheelchair Recipient: Emma is an 11 year old pug with significant hind leg neuropathy. Emma is losing control of her back legs. She now wobbles when she walks and her legs begin to cross and she can't correct them. 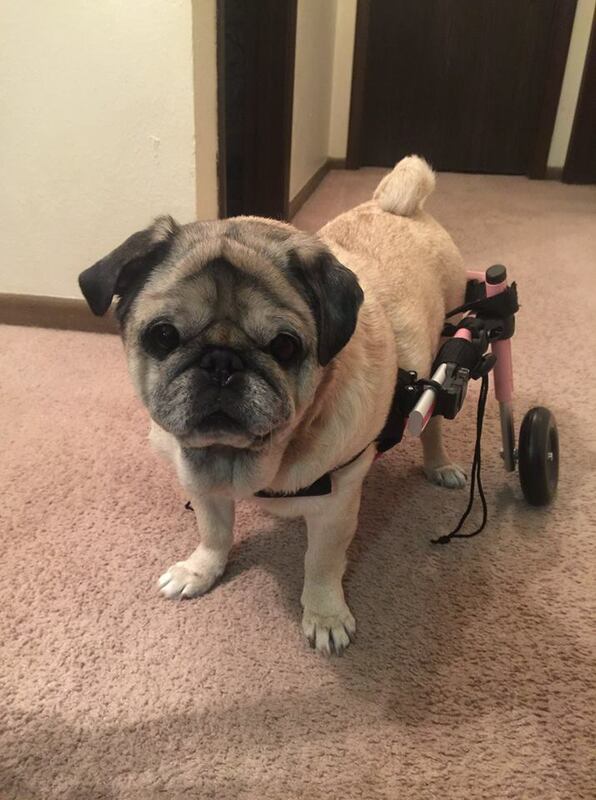 Rocco is a 14 1/2 year old pug from Nashville, TN who received a small wheelchair from Wheeling Superheroes. Rocco's personality continues to shine, despite losing his left eye and now succumbing to hind end paresis. Rocco recently underwent enucleation surgery after rigorous attempts at saving his left eye, upon recovery he never missed a beat. Chip is an 8 year old Dachshund from Los Angeles California who received a wheelchair from Wheeling Superheroes. Chip's mom came to us because Chip is unable to walk due to paralysis of his hind limbs. He's currently on several medications. Chip went through surgery last year for a slipped disc. 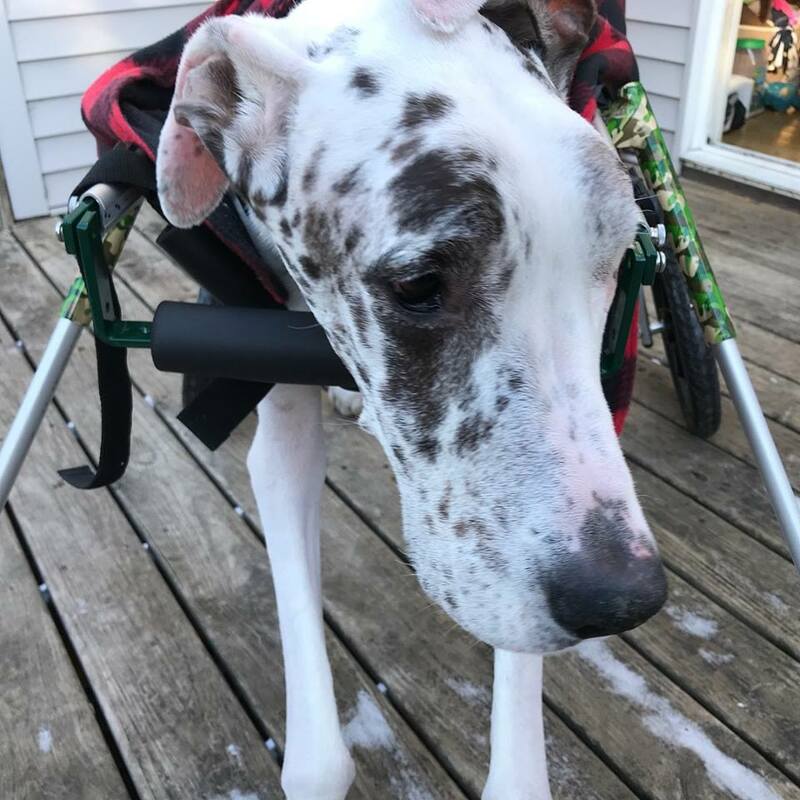 Hank is a 6 year old Great Dane who received a wheelchair from Wheeling Superheroes. "Today, Hank (and I) got a generous, beautiful, incredible gift from a wonderful organization. I had mentioned a few weeks ago that it was becoming obvious that Hank's overall health was stable, but his ability to walk was never going to get better, certainly not even to the point he was at right after his surgery.